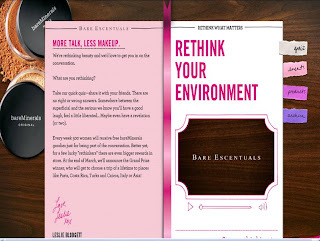 I know a lot of you are familiar with the mineral makeup company Bare Escentuals. They were the first mineral makeup brand I ever tried out, and continue to be one of the leading companies out there. I was recently contacted by a representative of the company to spread word on their new "Rethink What Matters Campaign". Their website http://www.rethinkwhatmatters.com/ will host a huge giveaway as of 2/19/10. Meanwhile, the site will be having weekly giveaways engaging you all with thought provoking topics. This new approach will help bring awareness to some of their new products, get a sense of who their readers are, and engage you all in a lot of awesome giveaways. Each week there will be a new topic where you all can voice your thoughts. I'll be sharing information about these giveaways as well as doing some reviews of my own. Today's topic is Rethink Your Environment with 500 instant wins of the bareMinerals Blush. FTC Disclosure: I have not been paid to promote this product. how cool is this? i've used BE on and off for the last few years... had my highs and lows. cant wait to try out their new products, and maybe win some!